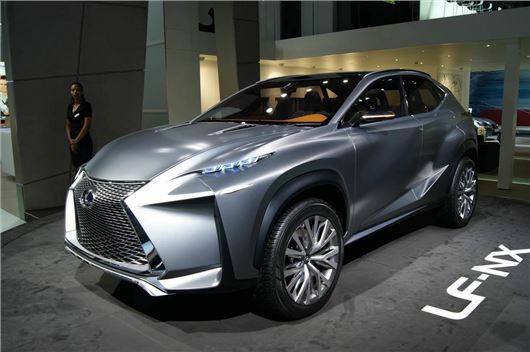 Lexus has revealed its exciting new LF-NX 4x4 concept car at the 2013 Frankfurt Motor Show. It continues the bold and angular styling theme originally set-out in the LF-A supercar, and now filtering down through the range. Lexus describes the crossover concept is a design study, but if it receives a positive reaction at the show, expect to see a production version to follow. The car, which would sit alongside the GS in the range would enter a crowded and expanding sector of the market, currently dominated by the BMW X3 and Audi Q5. The LF-NX concept is powered by a new variation of the Lexus Hybrid Drive full hybrid system, which has been specifically tuned for both off- and on-road use. It combines a 2.5-litre, four-cylinder petrol engine with a power electric motor. And like all hybrid Lexus models, the LF-NX can be driven under electric motor power alone - although it's expected to have an improved battery-only range. The cabin is far less outrageous, but it’s not without typically emboldened concept car features like a glowing blue centre stack and instruments and the orange trim details. The dashboard and controls have been designed for simplicity, and it's divided between an upper display zone and lower operation zone, as is traditional for Lexus. But Lexus promises intuitive interaction with the concept vehicle’s next generation technology, including touch-sensitive electrostatic switches and a new touchpad Remote Touch Interface design. In theory the concept hints at what a future sub-RX 4x4 Lexus will look like, but chances of it being so radical are pretty slim, although expect to see some of those characteristic slashes make it into production, given the design language now incorporated into the IS and GS ranges.